Thorsten Quandt is a Professor of Communication Studies at the University of Münster, Germany. Thorsten Quandt is a German communication scholar and online researcher, holding the chair of online communication at the University Münster. He is best known for his work on digital games, Internet use and online journalism. 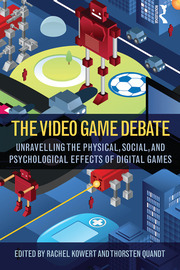 He (co)authored more than 100 scientific articles and several books, primarily in the field of online media and digital games research, including "Multiplayer" and "The Video Game Debate". Quandt is the founding chair of the “Digital Games Research” section of the European Communication Research and Education Association (ECREA), and a member of the Executive Board of ECREA. He is currently an Association Editor of the Journal of Communication, and a board member of the journals Communication Theory, Digital Journalism and Cogent Social Sciences. He has been the secretary of the Journalism Studies Division in the International Communication Association (ICA), and the chairman of the Journalism Studies Division in the German Communication Association.